Is Rajinikanth’s daughter against Jallikattu? What is Rajinikanth’s stand? Soundarya Rajinikanth, daughter of Indian actor Rajinikanth has today been announced by the Animal Welfare Board of India (AWBI)” that Ms.Soundarya Rajinikanth has accepted their invitation to be a co-opted Member of the Board and, in addition, to serve as a member of its Performing Animals Sub Committee. AWBI is the main petitioner against the South India’s especially the Tamil Nadu’s traditional Jallikattu and Bullock cart race being carried out in various parts of India. Cattle rearers, Farmers of Tamil Nadu, most of the Politicians of Tamil Nadu and the general public have been fighting in the judiciary and with the Indian Government to Lift the Ban implemented against conducting of Jallikattu. 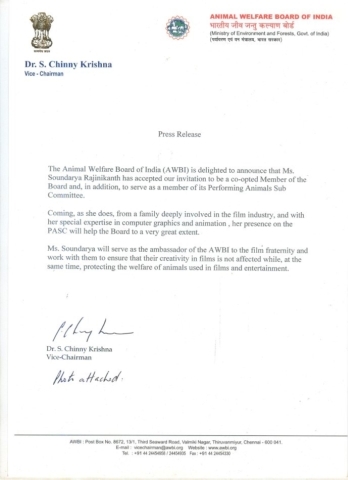 At this point of time, Soundary Rajinikanth has accepted the invitation of AWBI to be a co-opted Member of the “Animal Welfare Board of India (AWBI)”. Rajinikanth who is said to the Superstar of Tamil Nadu has always raised his voice in support of the people of Tamil Nadu. His fans especially who are in the southern part of Tamil Nadu are agriculturists, farmers and cattle rearers and apart from it people are craze to watch Jallikattu. It is unknown whether Rajinikanth was aware earlier, about Soundarya Rajinikanth’s acceptance to be a co-opted member of AWBI! If at all Rajinikanth comes to know about Soundarya Rajinikanth’s acceptance to be a co-opted member of AWBI, what would he comment about it!! Will Soundarya Rajinikanth realise at least now that AWBI is the main petitioner to Ban Jallikattu, which has been carried out traditionally for more than 3000 years? Will the fans of Rajinikanth especially from the southern part of Tamil Nadu accept Soundarya Rajinikanth’s future involvement in AWBI?? Would the farmers, cattle rearers, politicians who support Jallikattu object against Soundarya Rajinikanth’s acceptance as co-opted Member of the “Animal Welfare Board of India (AWBI)”.